Today is the 90th anniversary of the death of Blessed Columba Marmion, priest, abbot, and eminent Doctor of life in Christ. I am profoundly indebted to Blessed Marmion for all that I have received through his writings and through his intercession. I was introduced to Abbot Marmion 46 years ago. He has never left my side. Today I want to give thanks publicly for Blessed Columba Marmion's presence in my life. I believe that Our Lord gave him to me as a teacher, a father, and a friend. Such things happen in the Communion of Saints. I thank and praise God, the Father of Lights, for Blessed Abbot Marmion's teaching, his paternal care over my soul, and his friendship. I ask God our Father to hasten the canonization of Blessed Columba Marmion, so that he whom Christ has hidden with Himself in the glory of the Father in heaven, may be more widely known and glorified in the Church on earth. Blessed Columba Marmion may very well be the greatest gift in modern times of the Church in Ireland to the Church universal. Catholic Ireland needs the affirmation, the consolation, the joy, and the holy pride that will come from the beatification and canonization of those sons and daughters of hers who illumined modern times with the radiance of the Face of Christ shining through them. 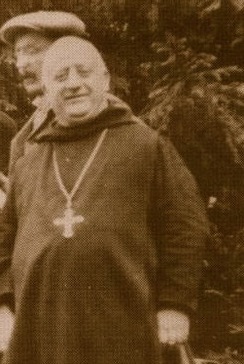 I could mention, among others, Father Willie Doyle, Frank Duff, Edel Quinn, Matt Talbot, Father John Sullivan, and Little Nellie Organ but, of all of these, Blessed Columba Marmion is the one whose Christ-centred life and teaching, like a lamp on a lampstand, shone most brightly in the Church of the 20th century, and in souls. The priest is raised to a dignity which is, in a certain sense, divine, for Jesus Christ identifies Himself with him. His role as mediator is the highest vocation in this world. It is worth repeating: if a priest did nothing during his whole life but offer the Holy Sacrifice piously every morning, or even if he were to offer it once, he would have accomplished an act greater in the hierarchy of values that those events which convulse the world. For the effect of every Mass will endure for eternity, and nothing is eternal except the divine. We must orient our whole day towards the Mass. It is the central point and sun of the day. It is, as it were, the focus from which there comes to us light, fervour, and supernatural joy. We must hope that, little by little, our priesthood may take possession of our soul and our life so that it may be said of us: "he is always a priest." That is the effect of a Eucharistic life, embalmed in the perfume of the sacrifice which makes us an alter Christus, another Christ. He presents the monastery as a place where the Kingdom of God has already come, a place wherein every weakness can encounter mercy, wherein the human will is directed into the Will of God through the good that is obedience, and wherein every heart of stone, having become a heart of flesh through the grace of compunction, is freed at last to love and to be loved. Today is the feast of a great Irish saint! Born and educated in Dublin, Joseph Marmion served as a parish priest and seminary professor before becoming a Benedictine monk at the Abbey of Maredsous in Belgium. 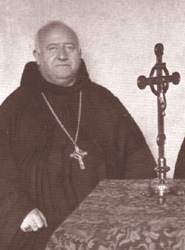 Dom Columba Marmion was elected of Abbot of Maredsous in 1909. He chose to receive the Abbatial Blessing on Rosary Sunday. It fell that year on October 3rd. When Pope John Paul II beatified Abbot Columba Marmion in 2000, the liturgical memorial of the new Blessed was fixed on the date of his Abbatial Blessing, rather than on the day of his death, January 30th. In 1985 Pope John Paul II visited Belgium. When the papal helicopter flew over the Abbey of Maredsous on the way from Brussels to Beauraing, the Holy Father confided to one of his aides: “I owe more to Columba Marmion for initiating me into things spiritual than to any other spiritual writer.” The saints engender saints, and this in every age. My own introduction to Abbot Marmion came when I was fifteen years old. I was visiting Saint Joseph’s Abbey in Spencer, Massachusetts. Father Marius Granato, O.C.S.O., charged at that time with helping young men -- even very young men -- seek God, put Christ, the Ideal of the Monk into my hands. He even let me take the precious green-covered volume home with me. With all the ardour of my fifteen years I devoured it. No book had ever spoken to my heart in quite the same way. I read and re-read Christ, the Ideal of the Monk. At fifteen one is profoundly marked by what one reads. The impressions made on a soul at that age determine the course of one’s life. As I pursued my desire to seek God, I relied on Abbot Marmion. I chose him not only as my monastic patron, but also as my spiritual father, my intercessor, and my guide. If you are looking for a good spiritual director, choose Blessed Columba Marmion. His books are being re-edited in attractive, revised translations that present his timeless doctrine in all its freshness and beauty. From his place in heaven he remains attentive to souls and ready at every moment to direct them to Christ. As a novice, Columba suffered under the direction of a Master of Novices who was singularly lacking in human warmth. He never forgot this and, later in his monastic life when he was entrusted with positions of authority, he did everything possible to be jovial, joyful, and full of compassionate sympathy in his relations with others. He did this in spite of long periods of spiritual darkness, even as he struggled through the seasons of depression that marked his whole life. Abbot Marmion tried always to bear his burdens of physical, emotional, and spiritual suffering without allowing them to become a weight on others. All his life, he was intensely devoted to the Passion of Christ, making the Way of the Cross every day. His meditations on the Way of the Cross in Christ in His Mysteries are, to my mind, unequalled. Blessed Columba entered deeply into the sentiments of Our Lord's Sacred Heart. Through the writings of Saint John and Saint Paul, he contemplated the Face of Christ set toward the Father's perfect will, the fulfillment of the Father's saving design of love, the Father's promise of glory. Thus did he come to see his own sufferings of body, mind, and spirit as participation in the redemptive sufferings of Christ. Blessed Abbot Marmion had the gift of teaching souls to relish the Word of God. In his own experience, Sacred Scripture was, first of all, proclaimed, chanted, heard, held in the heart, and prayed, in the context of the liturgy. His astonishing familiarity with the Bible came to him not by way of study but through the Divine Office, the daily round of the Opus Dei, the Work of God celebrated in choir. Dom Marmion attributed to the words of the Bible the grace of a particular unction: something penetrating, a kind of sacramentality that puts us in communion with Christ himself, the Word before whom every human tongue falls silent. It was recounted that when Dom Marmion taught theology to the young monks, they would leave the classroom after his lectures in a reverent silence and go directly to the choir to adore. This is monastic theology! As a spiritual father, Blessed Columba insisted on the primacy of the liturgy. Well before the Second Vatican Council, he preached the liturgy as "source and summit" of the life of the Church. He quenched his thirst for God in drinking directly from the liturgy's pure wellsprings and led a great number of Christians to do the same. Dom Lambert Beauduin, another father of the classic Liturgical Movement, wrote concerning Abbot Marmion: "He revealed to us the soul of the liturgy; by this I mean all the elements of doctrine and of life, that the liturgy reserves for us beneath the visible veil of its rites and symbols." In his book, Christ, the Ideal of the Monk, Blessed Columba generated a movement of return to the Rule of Saint Benedict and offered a re-reading of the text capable of irrigating the monastic life of every generation. His vision of Benedictine life is profoundly human and profoundly supernatural. He presents the monastery as a place where the Kingdom of God has already come, a place wherein every weakness can encounter mercy, wherein the human will is directed into the Will of God through the good that is obedience, and wherein every heart of stone, having become a heart of flesh through the grace of compunction, is freed at last to love and to be loved. He presents the abbot at the service of his brothers as a Father, as a Spirit-bearing Doctor, and as the Pontiff, the one who assembles the community to pass over into Christ's own worship of the Father. Let us seek the intercession of Blessed Columba Marmion today for ourselves and for each other. He will obtain for us the grace of fixing our gaze on the Face of Christ set toward all that the Father wills, toward the mystery of the Cross through which joy has come into the world. The Most Holy Eucharist is the real presence of Christ, the Life of the Soul. The Most Holy Eucharist is the real presence of Christ in His Mysteries. The Most Holy Eucharist is the real presence of Christ, the Ideal of the Monk. How blessed we are to be called, with Abbot Marmion and all the saints, to the Banquet of the Lamb. Last June I learned of the serious illness of the young and gifted Abbot of Monte Cassino, 51 year old Dom Pietro Vitorelli. Nothing could be more fitting, it seems to me, than to seek the intercession of another Benedictine Abbot, Blessed Columba Marmion, to obtain Abbot Pietro's complete restoration to health. The liturgical feast of Blessed Abbot Marmion is October 3rd. Beginning today, please join with me in making this novena. 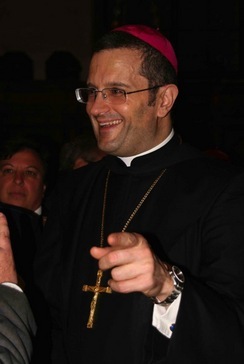 If you leave a comment indicating that you too are praying for Abbot Pietro, I will be sure to let him know that prayers are rising heavenward from all over the globe on his behalf. Feel free to post this novena on your own blogs and sites and to diffuse it widely among Catholics the world over, who treasure the spiritual patrimony of Monte Cassino and desire to see its Father Abbot strong and healthy again. 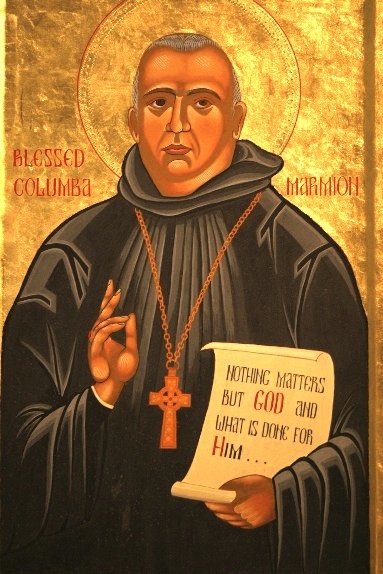 Novena to Blessed Abbot Columba Marmion, O.S.B. even to the bosom of the Father. V. Pray for us, Blessed Columba Marmion. R. That our lives may be hid with Christ in God. 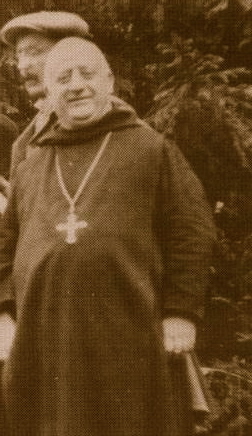 Désiré-Joseph Cardinal Mercier (1851-1926) was Archbishop of Malines, Belgium from 1906 until his death. 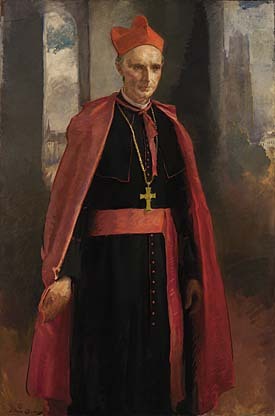 Besides the heroic leadership he demonstrated during World War I, Cardinal Mercier hosted the famous Catholic-Anglican dialogue known as the Malines Conversations, and obtained the establishment of the liturgical feast of the Blessed Virgin Mary, Mediatrix of All Graces with its proper Mass and Office. 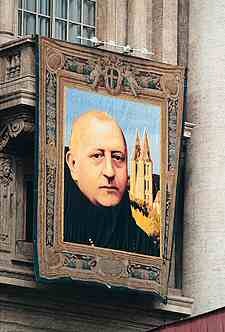 His spiritual mentor was Blessed Dom Columba Marmion. Once, when someone asked Cardinal Mercier how much time what ought to spend on prayer, he replied: Il faut donner à l'oraison autant de temps que l'on peut -- One must give to prayer as much time as one can. To someone else, he said: Ce n'est qu'après trois ou quatre heures de prière que viennent les grandes lumières, -- It is only after three or four hours of prayer that the great lights come. Today is the last day of our Novena to Blessed Columba Marmion. We offer thanks for his intercession and -- we have decided to begin a second Novena to him tomorrow. This second Novena will end on September 27th. The great-hearted Irish Abbot is a powerful intercessor, ever ready to help and comfort people from his place in heaven, just as he was ready to help and comfort people during his life on earth (1858-1923). I pray that God may give you the grace to abandon yourself entirely into the hands of Jesus Christ; for when we abandon ourselves with absolute confidence and without reserve, to His wisdom and love, He takes a most zealous care of every detail of our life; for, says Saint Paul, "Jesus Christ is our wisdom, our sanctity, our patience, our justice and redemption from God." "Reveal thy way to the Lord and hope in Him, and He will do the rest." We continue our novena, recommending these intentions to Our Lord through the intercession of His devoted servant, the Irish Abbot, Blessed Columba Marmion, O.S.B. 1. Anthony DiRocco, the father of Brother Cassian Di Rocco, O.S.B., recently diagnosed with a very grave illness. Pray fervently that Blessed Abbot Marmion come to the help of Mr. Di Rocco, and of his little brother in Saint Benedict (they belong to same Benedictine Congregation of the Annunciation). 2. The healing of our dear Oblate Brother Vincent Uher, who is suffering grievously and waits upon God for some measure of relief, if such be His adorable Will. Ask Blessed Abbot Marmion to visit him with the healing power of Our Lord. 3. The health of Brother Benedict, one of my novices, who slated to undergo a delicate surgery next month to remove an infection from his sinuses. Brother Benedict is suffering quite a lot from his condition. Surely, Blessed Abbot Marmion will be sympathetic to his plight. 4. The health of Ann Margaret Felzke, the dear mother and grandmother of a family close to our monastery. 5. Good health for Father Mark's mother, Emma Rose Kirby. 6. Healing for Mary Melinda Buxton, sister of Oblate Sheila Michie. 7. Healing for Margaret Lawler, the mother of Scott. The Novena began on September 10th. Here, we are reciting it daily after Holy Mass, and the Mass will be offered each day for the intentions mentioned above and for any intentions of yours that you would like to have included in the Novena. Continue reading Novena to Blessed Columba Marmion.